Leslie Knope, our ambitious friend from Pawnee, Indiana, resurfaced today with much-needed insight on the best ways to process the surprising presidential election. 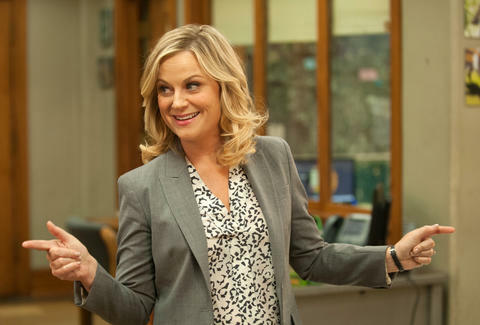 And just how did a fictional character played by Amy Poehler on the late, great Parks and Recreation emerge from the ether of show retirement, you ask? In the form of an open letter published on Vox, courtesy of an unnamed Parks and Rec writer. "Winston Churchill once said, 'Democracy is the worst form of government, except all those other forms that have been tried.' ... People making their own decisions is, on balance, better than an autocrat making decisions for them. It's just that sometimes those decisions are bad, or self-defeating, or maddening, and a day where you get dressed up in your best victory pantsuit and spend an ungodly amount of money decorating your house with American flags and custom-made cardboard cutouts of suffragettes in anticipation of a glass-ceiling-shattering historical milestone ends with you getting (metaphorically) eaten by a giant farting T. rex." "I acknowledge that Donald Trump is the president. I understand, intellectually, that he won the election. But I do not accept that our country has descended into the hatred-swirled slop pile that he lives in. I reject out of hand the notion that we have thrown up our hands and succumbed to racism, xenophobia, misogyny, and crypto-fascism. I do not accept that. I reject that. I fight that. Today, and tomorrow, and every day until the next election, I reject and fight that story." "On behalf of the grown-ups of America who care about you and your futures, I am awfully sorry about how miserably we screwed this up. We elected a giant farting T. rex who does not like you, or care about you, or think about you, unless he is scanning your bodies with his creepy T. rex eyes or trying to physically grab you like a toy his daddy got him. ... Our president-elect is everything you should abhor and fear in a male role model. He has spent his life telling you, and girls and women like you, that your lives are valueless except as sexual objects. He has demeaned you, and belittled you, and put you in a little box to be looked at and not heard. It is your job, and the job of girls and women like you, to bust out. "You are going to run this country, and this world, very soon. So you will not listen to this man, or the 75-year-old, doughy-faced, gray-haired nightmare men like him, when they try to tell you where to stand or how to behave or what you can and cannot do with your own bodies, or what you should or should not think with your own minds. You will not be cowed or discouraged by his stream of retrogressive babble. You won’t have time to be cowed, because you will be too busy working and learning and communing with other girls and women like you. And when the time comes, you will effortlessly flick away his miserable, petty, misogynistic worldview like a fly on your picnic potato salad." The Knope remarks came less than a day after election reactions from late-night hosts and other comedic forces, like Parks and Rec co-creator Michael Schur, began piling up. "Not everyone who voted for Trump is a racist, or a misogynist," tweeted Schur yesterday. "But they did vote for a racist and a misogynist." Read the rest of Schur's 28-tweet post-mortem and Knope's letter in full, and, if you're feeling especially despondent today, be sure to heed the latter's closing note: "We will acknowledge this result, but we will not accept it. ... Find your team, and get to work."